Dutch international attacking midfielder Ibrahim Afellay moved in winter break 2010-11 from PSV Eindhoven to FC Barcelona. The product of the PSV youth academy played his whole professional career for the Eindhoven based club before moving abroad. His contract was expiring in summer 2011 and with the mid-season transfer the Spanish club paid the Dutch a fee around two million euro. Afellay signed a 4,5 year contract until 2015 at the Spanish giants. In the 2012-13 season, Afellay played for German outfit Schalke 04 on a loan contract. The 2013-14 season was full with injuries and he played just a few matches. For the 2014-15 season, Afellay will try his luck in Greece on a loan deal at Olympiakos Piraeus. At the end of the 2014–15 season, he was released by Barcelona. 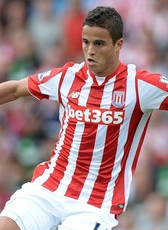 Afellay joined Premier League side Stoke City on a two-year contract on 27 July 2015. In March 2017 his contract was extended until June 2019. In January 2019 Afellay was released from his contract. He was unable to return in fitness and returned home to recover at his former club PSV.